If you thought Walking With Dinosaurs was scary in two dimensions just wait for a Full HD 3D dinosaur movie. The sight of a T-Rex (and not a cuddly Ice Age one) stomping across your living room looks set to become a terrifying reality when a new BBC movie thunders its way on to Blu-ray via a commercial cinema release in 2012. Fans of the original 1999 Walking With Dinosaurs series have had to get their dino-thrills on traditional standard definition DVD as the BBC has resisted the expense of reauthoring the show in HD. The picture will be made by BBC Worldwide's natural history brand BBC Earth in a co-production with US-based Evergreen Films. "The possibilities with dinosaurs are endless and we intend to explore every avenue," said Marcus Arthur, managing director of global brands for BBC Worldwide. The as-yet untitled project is expected to combine factual content about the prehistoric age with a story about the relentless struggle to survive. Evergreen co-founder Pierre de Lespinois commented: "The real dinosaur story outstrips anything you might find in science fiction and we're incredibly excited about showing our audience, on an epic scale, what their world really looked like 70 million years ago." The production will come from the stable responsible for classic nature fodder Walking With Dinosaurs, Life and the ground-breaking HD documentary series Planet Earth. 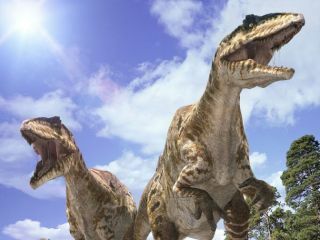 They will work with the team that made US hit series When Dinosaurs Roamed America and Dinosaur Planet.